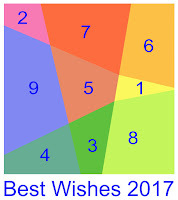 Sending this image with my best wishes to a circle of magic square enthusiasts on the 30th December 2016, I added the following postscript: "The areas are approximate, and I don't know if it is possible to obtain the correct areas with 2 vertically slanted straight lines through the square. Perhaps someone will be able to work this out in 2017?" Lee Sallows points out that, when comparing the initial square of his book with this new puzzle square, "in many (but not all) cases adjacent piece outlines have been made to complement each other. 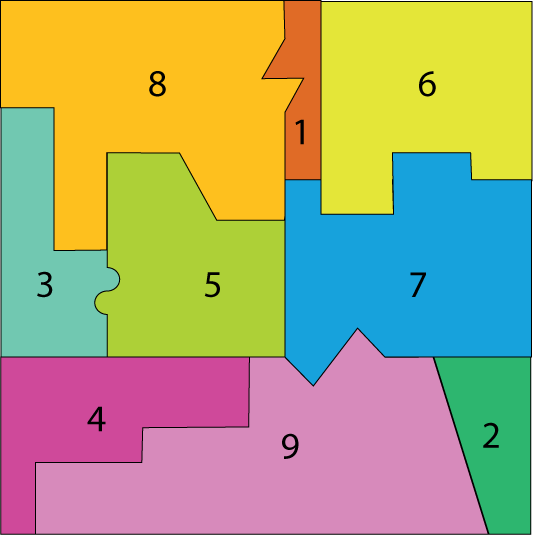 For every gain in area at one position there is an identical loss of area at another. In this way the areas of all 9 pieces remain as they were, so that the square remains a magical dissection." Thank you for your work Lee! I particularly like your puzzle solution. 1/ Each cell will have an area that corresponds with its number from 1 to 9. The total areas will therefore be 45. 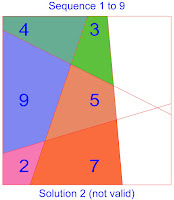 2/ The connections between the cells will remain unchanged, but as these cells will be of different sizes, the resulting latitudes, longitudes and diagonals will not necessarily be straight lines. 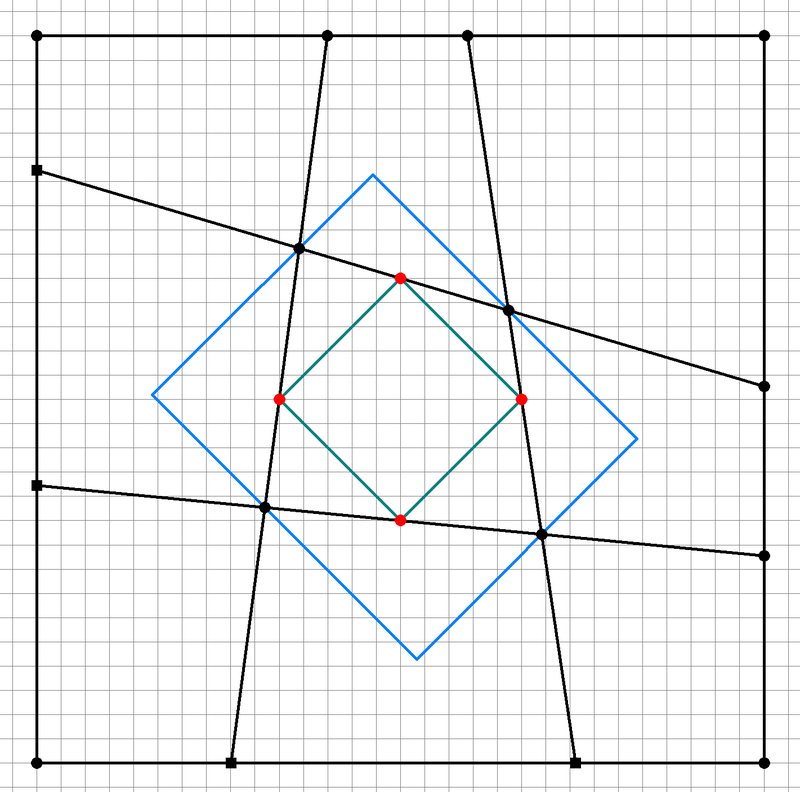 The initially square cells will become regular or irregular quadrilaterals, (excluding complex quadrilaterals). 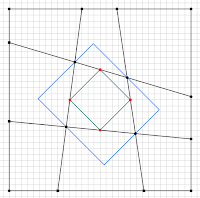 3/ The distances measured orthogonally between opposite sides of the resulting magic or semi-magic square viewpoints will always be √45, (the circumferences of the magic torus). 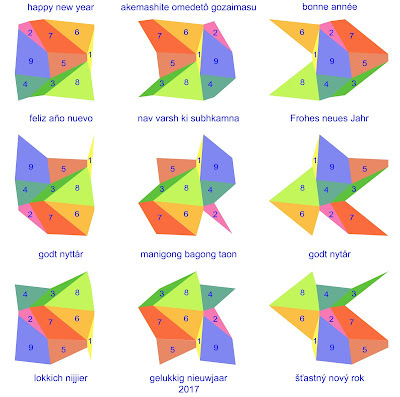 These extended best wishes, expressed through the complete set of third-order magic and semi-magic squares, include messages that reflect the multiple nationalities of the members of the magic square circle. 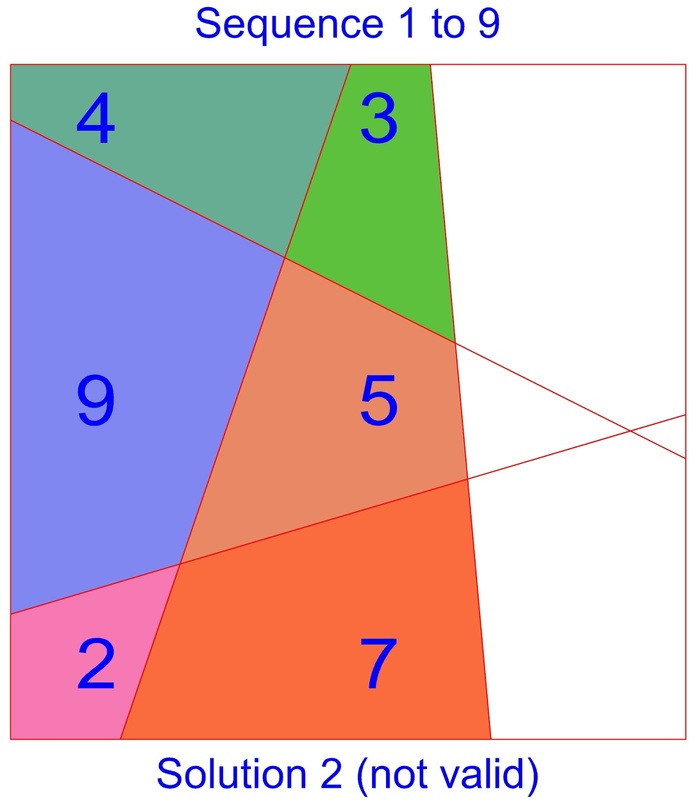 The magic square viewpoint of the torus is placed at the top left. 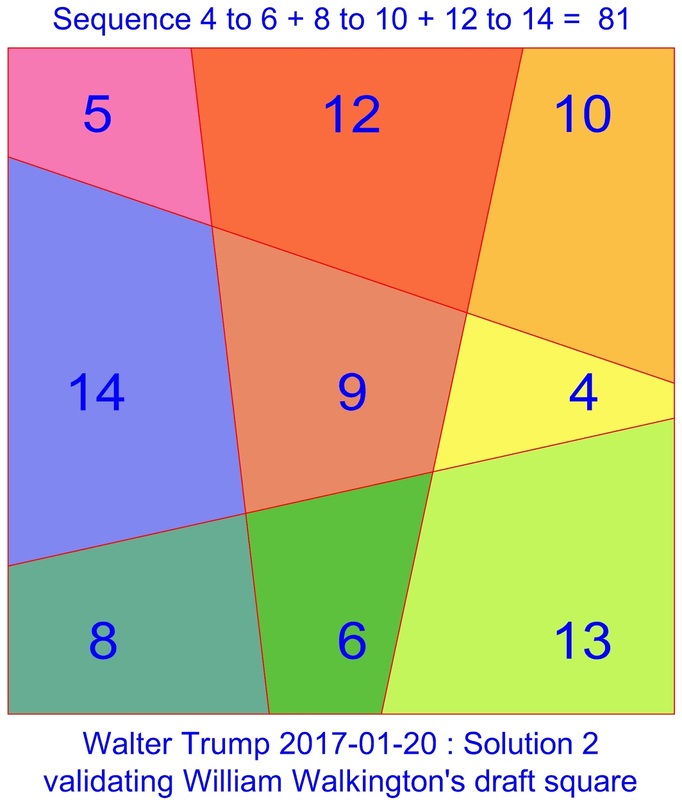 The patterns still need adjusting in order to achieve the correct areas, but as there is more flexibility, I am fairly confident that at least one accurate solution can be found. 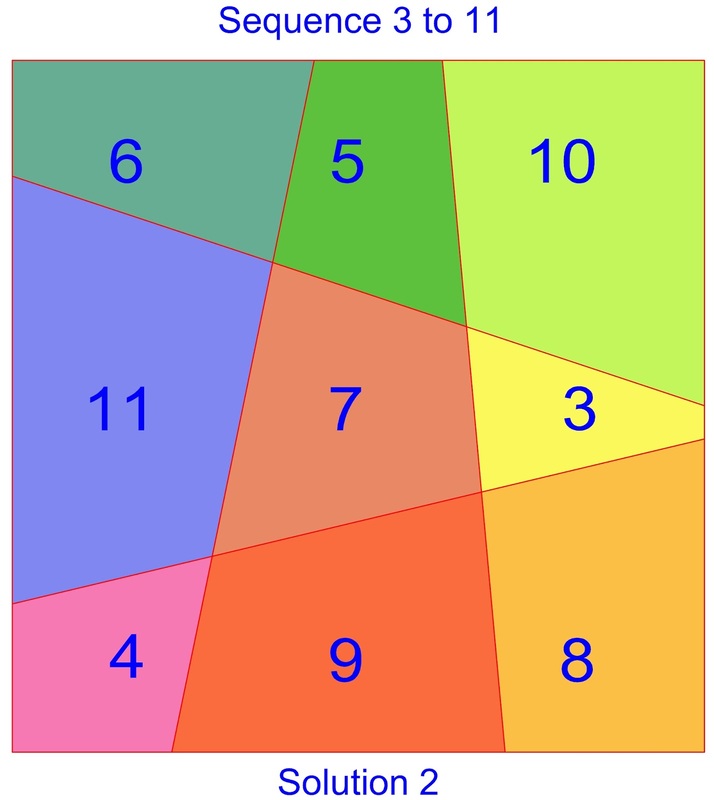 Inder Jeet Taneja then suggested that the problem with the sequence 1 to 9 was that the total areas did not add up to a perfect square area. He proposed that instead of using the numbers 1 to 9, perhaps we should try using the numbers 5 + 6 + ... + 13 = 81 = 9² ? Bravo Walter for your achievement following Inder's suggestion! 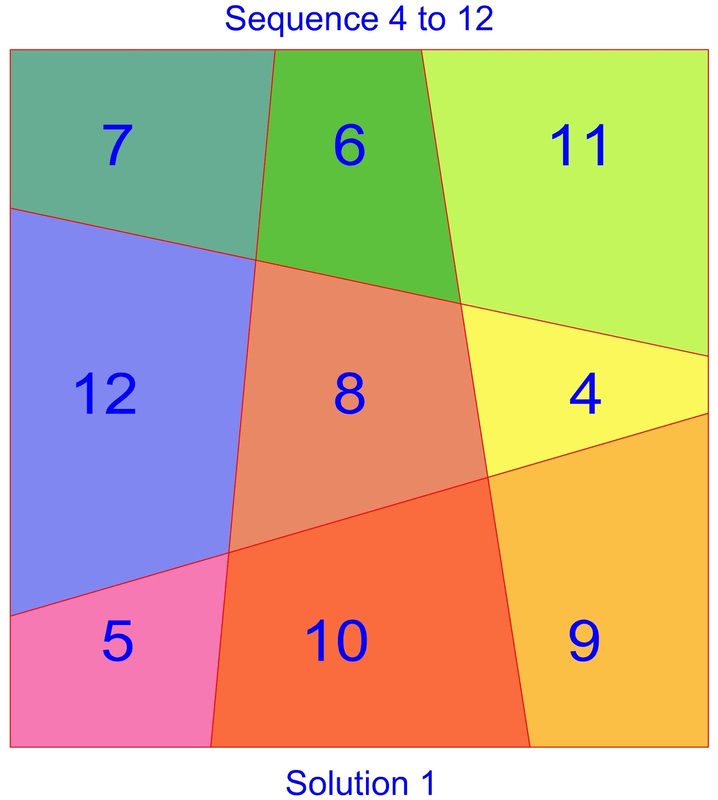 I hardly dared to believe that such a simple area pattern could produce a magic square! 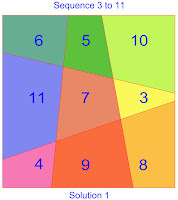 As I am not a programmer, I used Autocad to construct this linear area magic square manually. 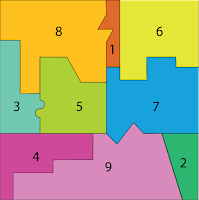 The areas of this provisional square are therefore only accurate up to two decimal places, before computer verification and area optimisation. 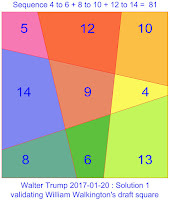 In the meantime Walter Trump continued writing a computer program to handle the equations and search iteratively for solutions. This was able to give orthogonal coordinates having at least 14 decimals after the commas. 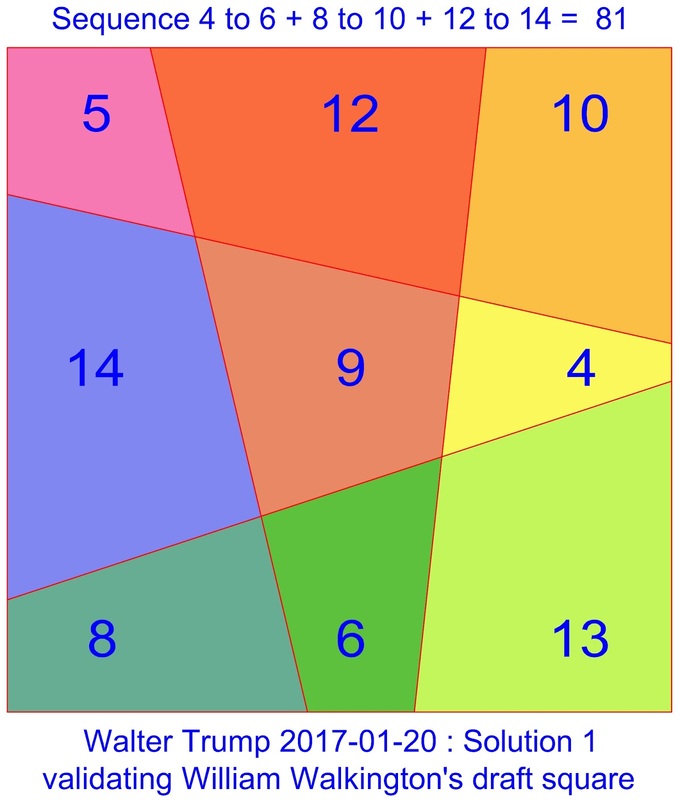 At first unable to solve the non-linear equations explicitly, Walter progressively improved his approach, and on the 8th January 2017 he sent us a message stating that for some sequences there were two solutions, and that the lowest number sequence ranged from 2 to 10! More recreational than mathematical, this "Mont Saint Michel" area magic square demonstrates that it is possible to use 2 continuous straight dissection lines - thus resolving the initial 2017 greetings card challenge. The design is an area magic square, because all of the cells are quadrilaterals (even if near triangular for the area 1), and all of their connections are preserved. 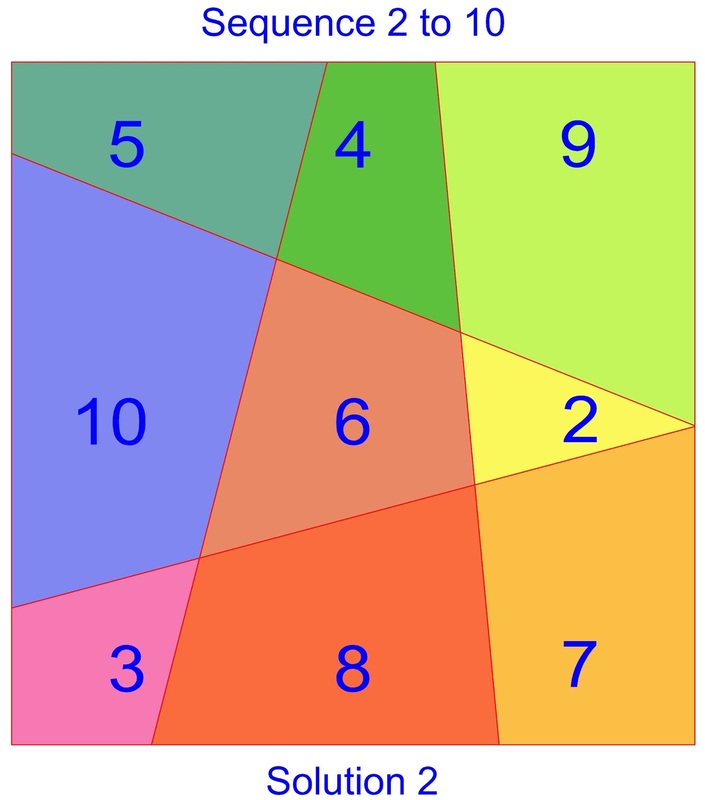 Inder Taneja has since followed up on his initial suggestions for perfect square sequences. 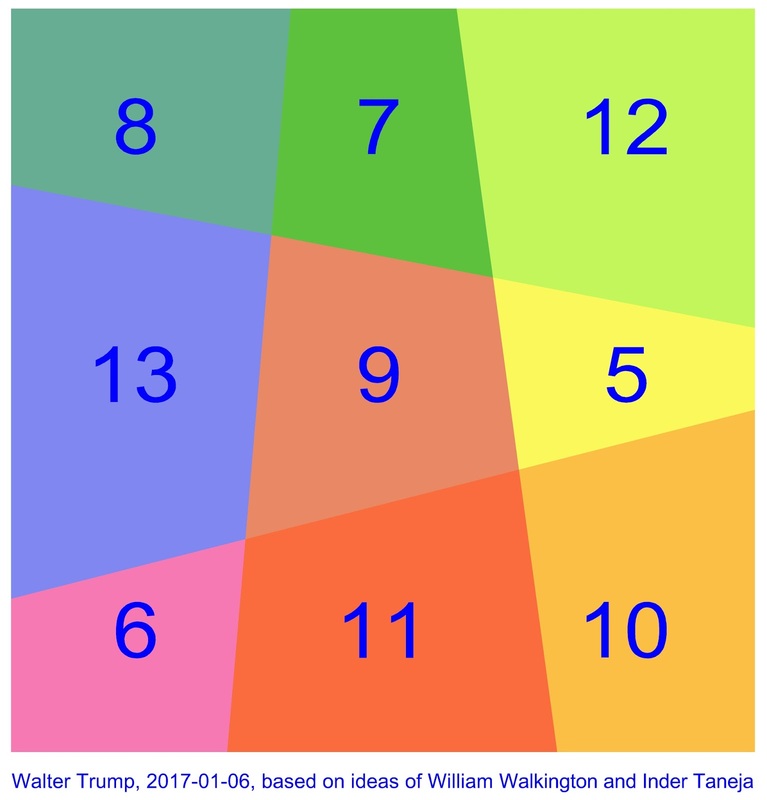 On the 11th February 2017 he published some very interesting results in his new paper "Magic Squares with Perfect Square Number Sums." 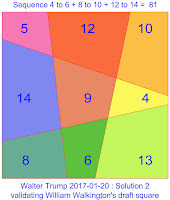 On the 13th January 2017 Bob Ziff intervened, stating that if we agree that the system of equations is soluble, then it is soluble to any number of digits, and proved his point by calculating the slopes with 1000 digits, using the professional software Mathematica and the four equations of Francis Gaspalou. 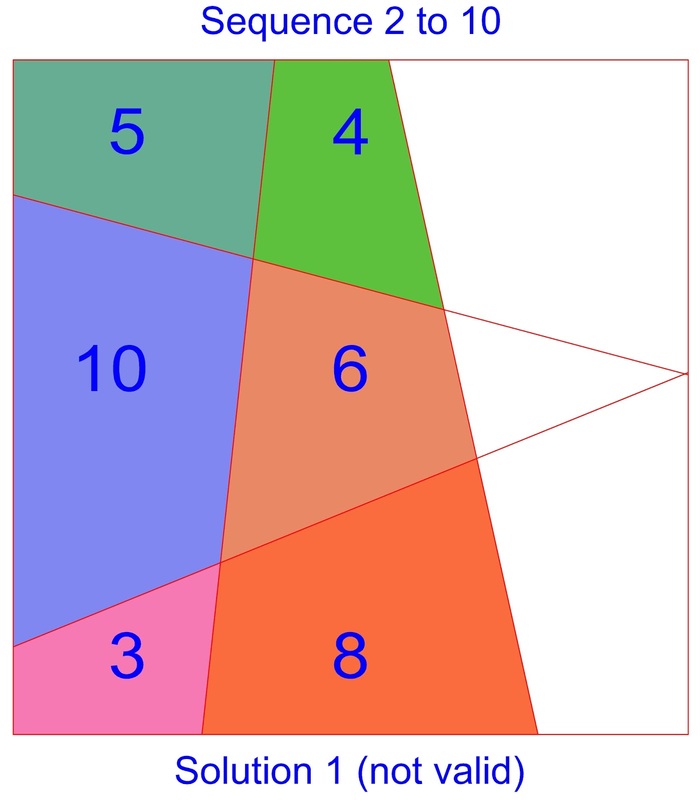 Francis Gaspalou has suggested that the next step might be to find a fourth-order area magic square with 6 continuous straight dissection lines, or even a concentric fifth-order area magic square. Why not imagine a contest, open to all, so as to find higher-order solutions of an equal mathematical importance to that of the third-order linear area magic squares? 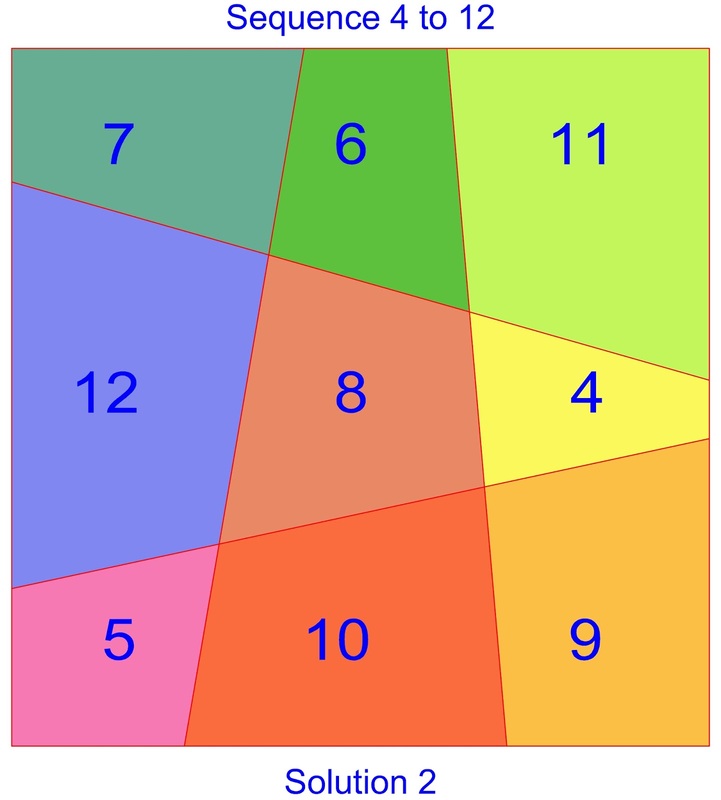 On the 19th January 2017 Greg Ross published an article on the subject of Area Magic Squares in his Futility Closet - An Idler's Miscellany of Compendious Amusements. 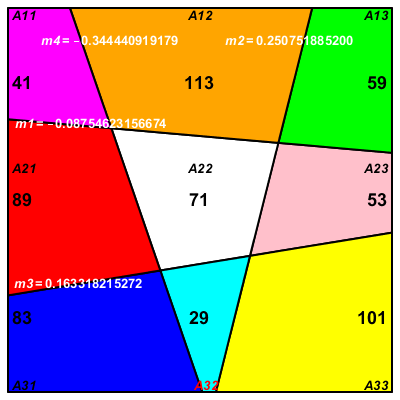 This article has since been relayed by Reddit Mathpics, Simplementenumeros, Prime Puzzles, Thermally Stressed Dairy Cows, and by Daily Design Stream, amongst others. 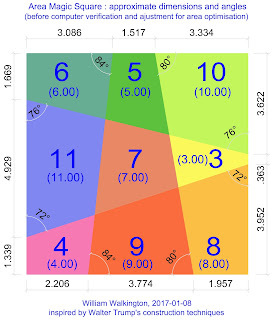 The palindromic primes used here are symmetrical numbers that remain the same when their digits are reversed. The magic sum of these 11-digit palindromic primes is 377,024,295,63. 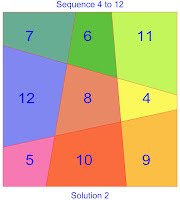 This area magic square is the conversion of a square that was originally sent by Carlos Rivera and Jaime Ayala to Harvey Heinz on the 22nd May 1999. Jan van Delden mentions that the direction coefficients of the lines are indicated in white, and that the quadrilaterals are numbered in the style of Francis Gaspalou. Full details of Jan van Delden's approach to the equations can be found in Prime Puzzles. 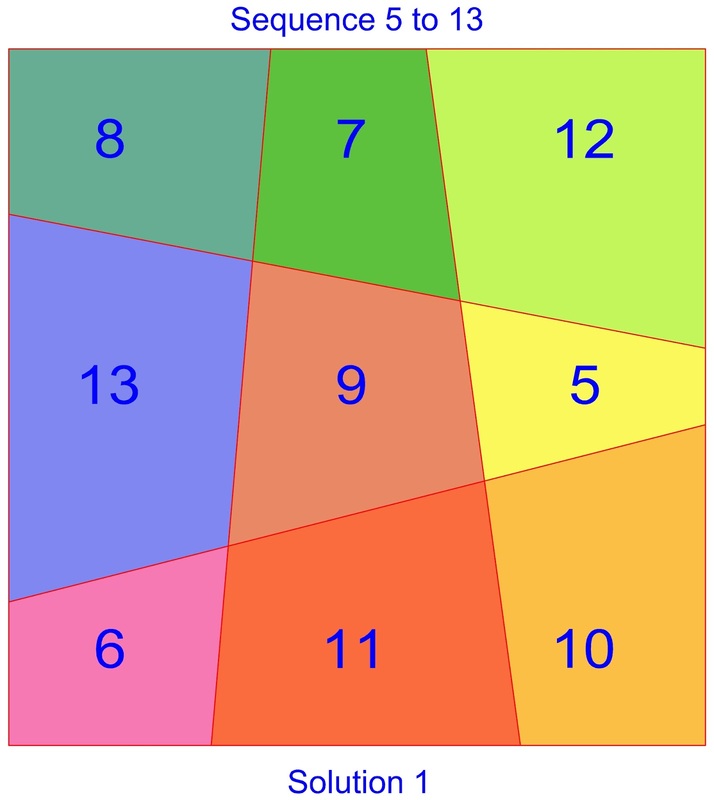 Jan states that this prime area magic square has a minimal magic sum of S=213. Congratulations Jan, for these prime achievements! Please note, that since the 5th March 2017, Jan has published a new paper entitled "Area Magic Squares of Order 3," in which he extends his findings. 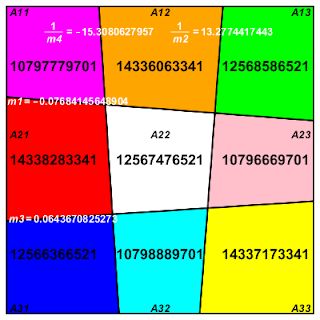 Seemingly, the number of order-3 linear area squares is infinite! 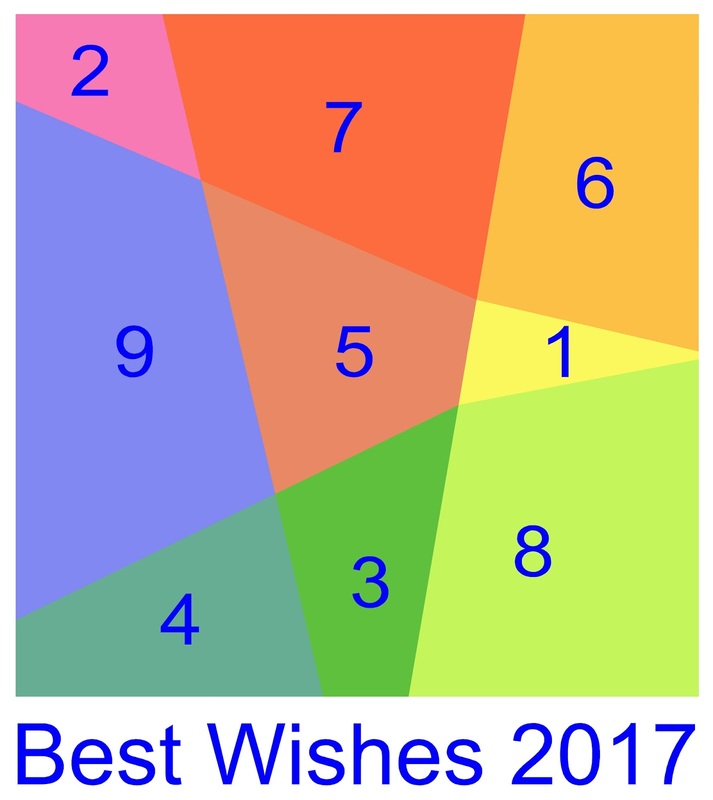 A new post on Area Magic Squares of Order-6 can be found in these pages since the 25th January 2017. 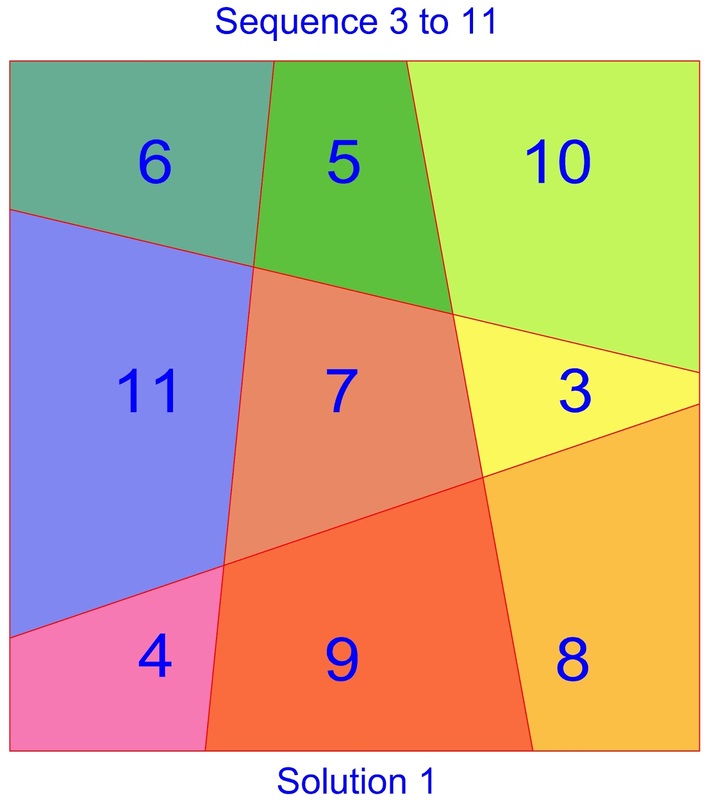 On the same day Hans-Bernhard Meyer published an article entitled Observations on 4x4 Area Magic Squares with vertical lines in his website: Math'-pages. 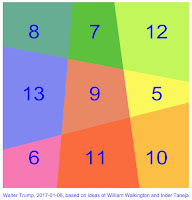 Since the 3rd February 2017, Walter Trump has published a chapter entitled Area Magic Squares in his website: Notes on Magic Squares. 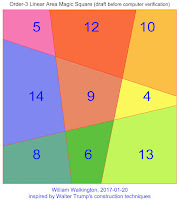 This chapter includes many analyses and examples of area magic squares of the third and fourth-orders. 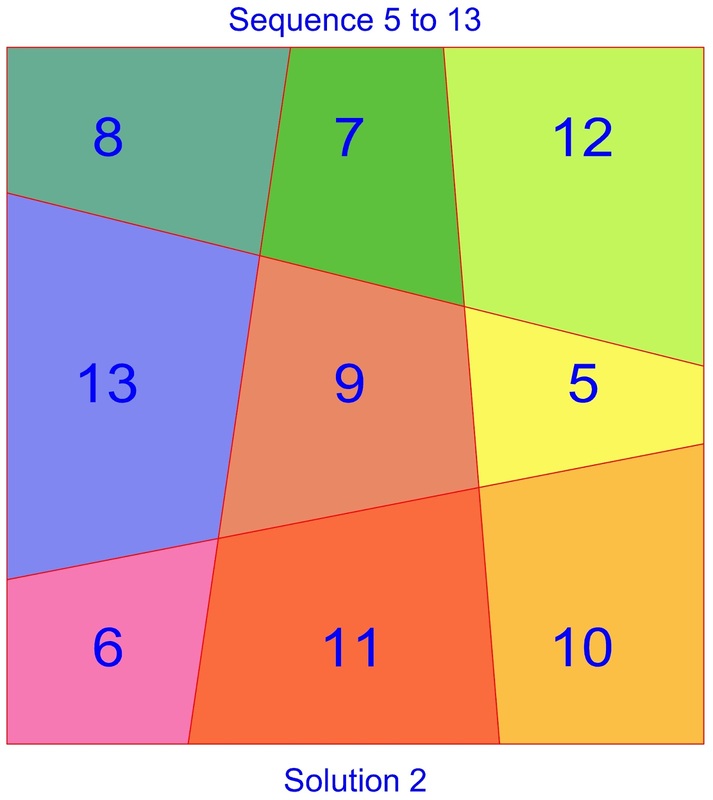 Since the 11th February 2017, Inder Jeet Taneja, inspired by the research in area magic squares, has published a new paper entitled "Magic Squares with Perfect Square Number Sums." 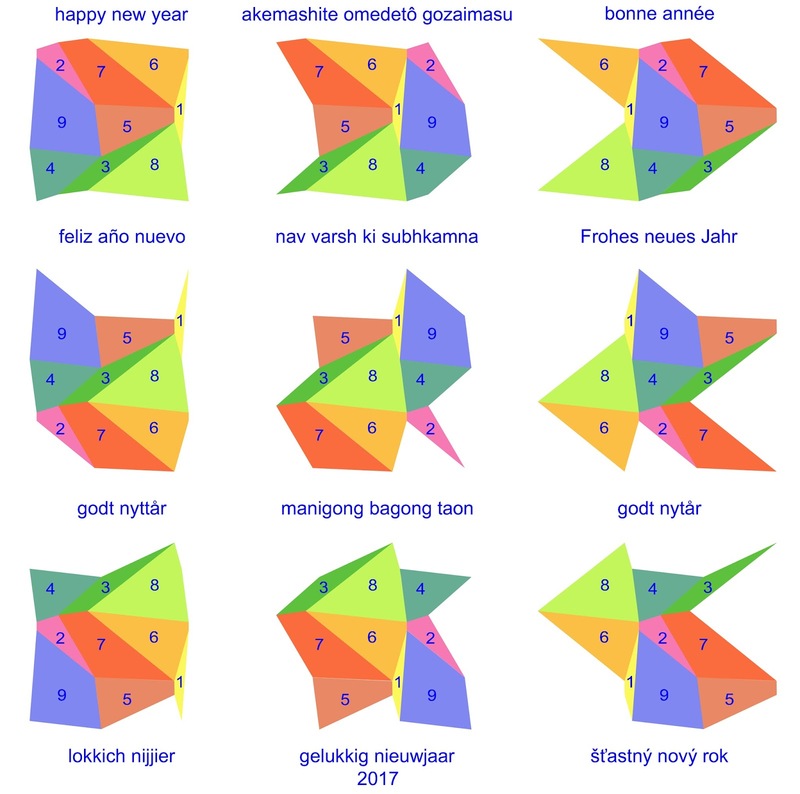 Since the 5th March 2017, Jan van Delden has published a paper entitled "Area Magic Squares of Order 3" in which he presents an improved algorithm. His work also includes new findings in area semi-magic squares of order-3, and a shoelace formula to measure the deviation in area. Since the 8th March 2017, following a tweet by Simon Gregg, Microsiervos published an article entitled "Cuadrados de áreas mágicas." This article has been relayed by Inoreader amongst others. 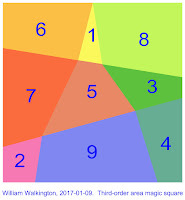 Since the 22nd March 2017, writing for EL PAÍS, Miguel Ángel Morales has included the subject of area magic squares in an article entitled "No solo de números consecutivos vive el cuadrado mágico."